The global market for filter bags is chiefly driven by the rising adoption of high-quality filter bags across numerous industries owing to the increased focus on reducing emissions and providing safer and high-quality work environment to employees. Reduction in costs of products and emergence of highly efficient products have encouraged the increased adoption of filter bags across small- and medium-sized enterprises. The market is expected to exhibit a CAGR of 5.6% over the period between 2016 and 2024. The global filter bags market, which held an opportunity of US$1,811.7 mn in 2015, is expected to reach US$2,950.1 mn by 2024 at this pace. The corresponding volume demand for filter bags in 2015 was estimated at 397 mn units. The key varieties of filter bags in the global market can be segmented into liquid filter bags and air filter bag. Of these, the segment of air filter bags finds enormous usage in applications such as dust collection and industrial emissions control. The performance of this segment is expected to surpass that of the segment of liquid filter bags over the period between 2016 and 2024. The segment of air filter bags is anticipated to exhibit a CAGR of 5.6% over the said period. Rising awareness regarding the need to reduce carbon footprint and different incentives granted by government for companies promoting green technologies have sensitized companies across several industries towards air filter bags. The key applications of filter bags are found in industries such as oil and gas, cement, mining, power plants, automobiles, aerospace, defense and marine, and water treatment. Of these, the oil and gas industry surpassed other industries and emerged as the leading revenue contributor to the global filter bag market in 2015. The industry is also anticipated to outdo other industries in terms of demand for filter bags, expanding at a CAGR of 6.2% from 2016 through 2024. Filter bags find use in the oil and gas industry for applications such as filtration of lube oils, distillation and cracking, gas turbine air/oil filtration, and filtration of glycol fluids. Of the key regional markets for filter bags, Asia Pacific is expected to emerge as the most promising one, expanding at a CAGR of 6.2% over the period between 2016 and 2024. The Asia Pacific filter bag market is chiefly driven owing to the high demand for air filter bags, the product segment which is also projected to outpace growth of other product varieties over the forecasting horizon in the region. Air filter bags are used for controlling the emission of dust particles and industry effluents and find enormous usage across industries such as oil and gas, mining, power plant, and cement for purposes such as gas purification, dust control, fly ash handling, and storage. Middle East and Africa is anticipated to acquire the place of the second most promising regional market, expanding at a CAGR of 5.9% from 2016 through 2024. The adoption of filter bags in the region has significantly improved in the past few years as an increasing number of countries are implementing stringent regulatory reforms to realize carbon control and environment protection plans. This has compelled the industrial sector in the region to increase the adoption of filter bags across a number of operations. The oil and gas sector has been the major contributor to the growth of filter bags market in the Middle East region, particularly Saudi Arabia. Some of the key vendors contributing to the growth of the global filter bag market are Thermax D Ltd., Pall Corporation, Babcock & Wilcox Co., Mitsubishi Hitachi Power Systems Ltd., Donaldson Company Inc., Eaton Corporation, Clarcor Inc.General Electric, Filter Concept Pvt Ltd., Camfil Farr Inc., Lenntech B.V., Rosedale Products Inc., W.L. Gore & Associates, Inc., Parker Hannifin Corporation and BWF Envirotech. The filter bags market report provides an in-depth analysis of the global filter bag market for the period 2014 – 2024, wherein 2015 is the base year and the years from 2016 to 2024 is the forecast period. Data for 2014 has been included as historical information. The report covers all the prevalent trends playing a major role in the growth of the filter bag market over the forecast period. It also highlights various drivers, restraints, and opportunities expected to influence the market’s growth during the forecast period. The study provides a holistic perspective on market growth in terms of revenue estimates (in US$ Mn), across different geographies, which include North America, Western Europe, Eastern Europe, Asia Pacific (APAC), Australia, Middle East & Africa (MEA), and Latin America (LATAM). The report provides cross-sectional analysis of the global filter bag market in terms of market estimates and projections for all the segments across different geographic regions. The report also covers profiles of major players, their growth strategies, their market positioning, and the various recent developments, and includes market positioning analysis of key players operating in the filter bag market. This research study on the global filter bag market provides a detailed analysis of various type of filter bag available in the market. Based on the size, the market is further divided into the 7" OD x 17", 7" OD x 32", 4" OD x 10" bag, 4" OD x 17", 6" OD x 20". On the basis of media, the market is segmented into woven and non-woven media, based on type, the market is segmented into liquid and air filter bag and based on application it is segmented into oil & gas, cement, mining, power plants, automobiles, aerospace, defense & marine, water treatment and others. The report includes a comprehensive coverage of the underlying economic development factors under the key trend analysis section. 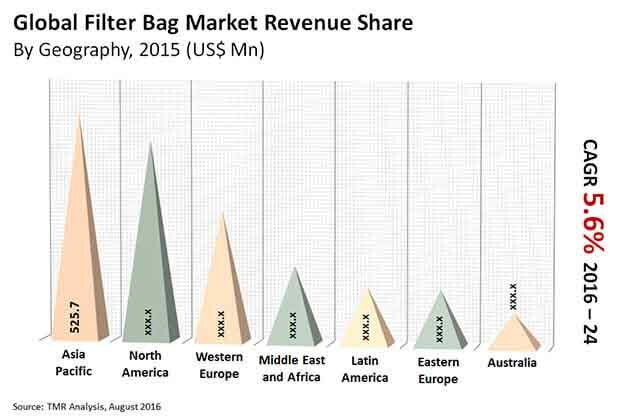 The report aims to provide a comprehensive analysis of the global filter bag market across geographical regions, which are further segmented to cover in-depth country level analysis. North America region is segmented into the U.S. and Canada. Similarly, Western Europe has been further segmented into the U.K., Germany, France, Italy and Spain. Eastern Europe has been segmented into Russia and Rest of Eastern Europe, Asia Pacific has been segmented into China, India, Japan, Australia and Rest of Asia Pacific; MEA is divided into the UAE, Saudi Arabia, South Africa, and Rest of MEA. Latin America has been further categorized into Brazil and Rest of Latin America. The revenue and volume estimates for these region is also included in the report. The report also provide regional level key trend analysis. Under the company profiles section, the report provides an overview of the players operating in the market, the strategies deployed by them to gain competitive advantage, the annual revenue generated by them in the past two or three years, and their relevant business segment revenue. The report also provide supplier and vendor analysis of the global filter bag across geographical presence. The key players profiled in this report include Babcock & Wilcox Co., Pall Corporation, Thermax D Ltd., Eaton Corporation, Mitsubishi Hitachi Power Systems Ltd., Donaldson Company Inc., Filter Concept Pvt Ltd., General Electric, Camfil Farr Inc., BWF Envirotech, W.L. Gore & Associates, Inc., Lenntech B.V., Rosedale Products Inc., Parker Hannifin Corporation and Clarcor Inc.